I haven’t been acquainted with SaladStop! in the Philippines as I’m always on the go to somewhere else whenever I get to pass their store in BGC. I’ve been wanting to try, but I never had the chance to do so. 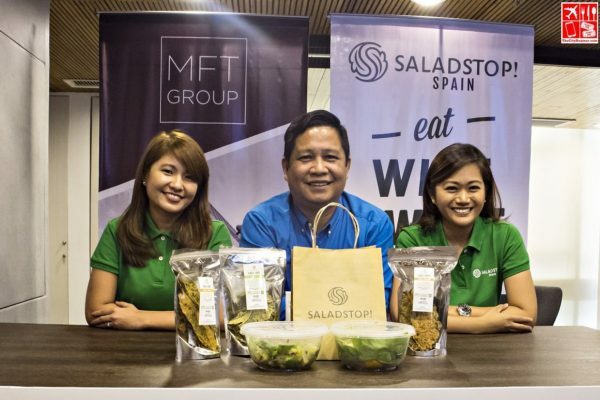 Until the last week of June when it was announced that MFT Group of Companies has acquired the SaladStop! Master Franchise for Europe, rolling out the first store in Spain. MFT Group of Companies is a financial holdings and investing group in the Philippines. The organization headed by Chief Executive Officer Ms. Mica F. Tan, has several investments in the retail, fashion & lifestyle, medical equipment, pharmaceutical, technology, manufacturing, and finance & investments with presence in the Philippines, Hong Kong, Singapore, Japan, United States and Europe. It’s acquisition of the SaladStop! master franchise in Europe is it’s first venture in the food industry. SaladStop! in the Philippines is franchised by another group. It’s a bold and confident move to acquire the franchise of the brand that traces its roots in Singapore. Established in November 2009, SaladStop! is one of the fastest growing, most scalable, quick-service concept. It’s considered an Asian brand, with branches in Indonesia, Japan, Hongkong and the Philippines. It’ll be the first time to setup shop outside Asia, with the leadership of the MFT Group. Ms. Joanne Atienza-Cabaero, MFT’s Regional Marketing Head, shared that SaladStop! is well-positioned as far as the global trend of healthy conscious eating is concerned. And with the robust product offerings, unique dressings and recipes, and an approach to holistic customer experience, the brand is set to be a success in Europe. Ms Cabaero also pointed out that SaladStop! is not just a food chain but a healthy movement for everyone. She explains further that the brand offers 12 signature salads and 4 tortilla wraps. Also, the dressings are home-made, fresh and with no artificial flavor and coloring. Operating under the ideology of “Eat Wide Awake,” SaladStop! wants everyone to stop and think about the food they eat. With philosophy, the menu offerings in all stores internationally are localized and this will be the same in Europe. We were told that MFT Group partner Pol Parareda, a finance and investment banker from Spain is already looking into establishing relationships with farmers and local ingredient suppliers. There could be no perfect timing to setup in Spain than now as people inclined to maintain a healthy diet is growing. MFT Group saw the increase of restaurants serving salads and the customers lining up for a table since they last visited two years ago. Even the agricultural industry proves that the supply of vegetables increased significantly year on year. The company’s COO shared that although there’s competition, the offerings can’t come close to what SaladStop! is offering. Swedish-born chef Emma Skoog, who has been in the F&B industry since 2001, will take the helm at SaladStop! Barcelona, owing to her significant experience in Spanish lifestyle and eating habits. After moving to Spain in 2004, and learning about Spanish cuisine, she became a cook at Barcelona’s Market Hotel and Restaurant. She later became kitchen chef at Menjador’s ”A Famous Tapas Place”. No doubt a dream team of individuals embracing the wellness movement in the food and beverage industry were gathered as well to ensure that SaladStop! stretches its reach outside of Asia. With its partners showing strength in numbers, the MFT Group of Companies is looking forward to opening more outlets in the coming years. It’s goal is to change the way people think about food. It’s great to see Asian brands conquering other continents such as Europe in business. That’s sort of reversing the trend where we see European brands coming in to Asia. We’ve seen them left and right here in the Philippines. As a SaladStop! master franchise holder in Europe, franchise applications will go through MFT Group. And a Filipino business having a say makes it even cooler.